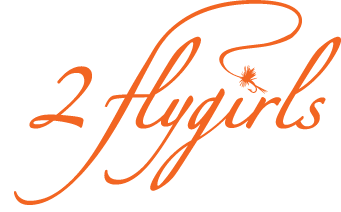 2 flygirls: River Therapy–Does a Soul Good! I drove up Saturday morning to one of my old favorites haunts. I took both my 8-weight switch and 5-weight singlehand rods down to the river. 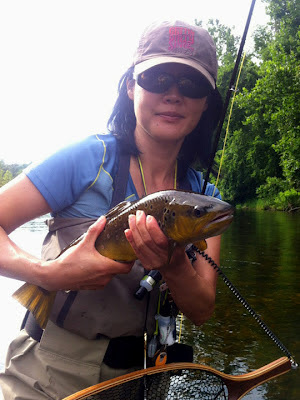 I started out practicing some spey casts as there was nothing going on. I could feel my stress dissolve with every cast (good and bad) and despite some floundering, it was immensely enjoyable. I made one particularly fine cast that reached the far bank about 80 ft. away, and to my surprise, a fish rose to my offering, a large isonychia dun. I set the hook. It was a good sized fish but it ended in a long distance release as he/she broke me off. Good knot, rushed angler. I just laughed it off. Then Antoine texted me to say he was done with his morning guide trip. We met up for a very long lunch. We had lots of catching up to do. It felt like ages since we last fished together. There were major changes to his life, all good, which I was happy to hear about. As the skies clouded over, we tracked storms headed our way on the radar map. It didn't look good but you never can tell. Antoine said he wanted to show me a new fishing spot–a prime nymphing location, guaranteed to hold some really nice fish when you're desperate for a fix ;). A few raindrops fell, but nothing significant, as we drove upriver. It turned out to be a challenging fishing spot—fast water, not easy to access or to wade, lots of obstacles. I dropped a pin to mark its location for a future desperate date. As we crossed the road back to the car, we both spot a completely flattened and dessicated field mouse on the pavement. Antoine grins and says "It's time to go mice fishing again..."
We drove back downriver to a spot near Greenwoods where we found numerous fish rising, even porpoising, in a deep channel along the bank. I had no idea what they were feasting on. Whatever it was, it was microscopic! Antoine however, with his hawk eyes, saw exactly what they were eating. He went back to his car to get another flybox. He returned and put on a tiny fly. Shortly after, he hooked one. Unfortunately, it resulted in another long-distance release. He gave me one of these flies which I put on a 15-foot leader with 7x tippet. Antoine tells me there is another spot on the opposite bank that usually holds 4 or 5 really nice fish. I'm sorely tempted to ask him, "So, what are their names? How old/big are they? Male/female, rainbow/brown? :)" The Farmington is his river. He knows it as well as anyone can. We vigilantly watched the far bank. Sure enough, after a few minutes, we spot a couple of rises. We quietly made our way upriver. He advised me to be patient. Wait till I spot a rise, mark it's exact location, then cast immediately to that spot. He said I might get 2 attempts, tops, before putting these smart, spooky fish down. One fish rose not very far away. But with a 15 ft. leader, I have to make several false casts to get enough line out (should have been prepared). I drop my fly gently on the surface. I'm thinking I might be a bit short, but Antoine tells me it went right over the fish. Turns out he clearly saw the fish, but apparently he/she wasn't interested. We wait patiently. Antoine spots a rise near him and goes in pursuit. I continue to scan the bank in front of me. Suddenly I spot a rise. It's automatic. My fish radar is on. I cast—she takes it—fish on! This time, I don't rush it. She turned out to be spotted beauty. It's an hour till dusk but Antoine is done. It has been a long day for him. Plus, he had driven back from fishing the Cape the afternoon before. We said goodbye and promised to fish again soon, perhaps some night fishing with mice patterns. I'm not ready for the day to end so I try one more spot. There are a few anglers there when I arrive. I settle into a spot between 2 of them. There are some very subtle rises on the glass smooth water in front of me. With the same tiny fly, I catch one last lovely brown before dusk—pure icing on the cake. It's been a while since I've had such an enjoyable day on the river. Merci, Antoine, and thank you, Farmington river. The therapy did this flygirl loads of good!